Roxy is a dog for all reasons. 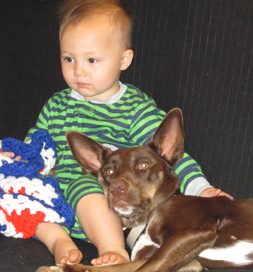 Beth Whitney of Vilas, NC, wanted a dog as a playmate for her toddler son and a companion for her husband and her. But she also wanted a dog that would warn off any strangers when her husband, a U.S. Army Reserve Sergeant, was away on training. Roxy finds a comfy place to lay her head. A friend told her about Petfinder, and she began searching. “I was quickly greeted by hundreds of beautiful furry friends, but one in particular stood out,” she says. She was a Doberman Pinscher mix listed on Petfinder by Elizabethton Carter County Animal Shelter in Tennessee. The three other dogs had been adopted, but the one remained at the shelter for a long time. Beth knew at once Roxy, as the dog is now named, was the perfect fit. “She is my workout buddy,” Beth says. “We take daily hikes on our property. When Roxy isn’t hiking with me, she is playing with my son on our deck or in the yard. “A majority of her time, however, is spent cuddled up on the couch with her head in my husband’s lap or engulfed in one of my son’s blankies while he uses her as a pillow,” she adds. The dog’s couch potato behavior gives Beth a laugh because Roxy’s “high energy” had discouraged several families from adopting her. Their loss was the Whitney’s gain. She’s everything they were hoping for.